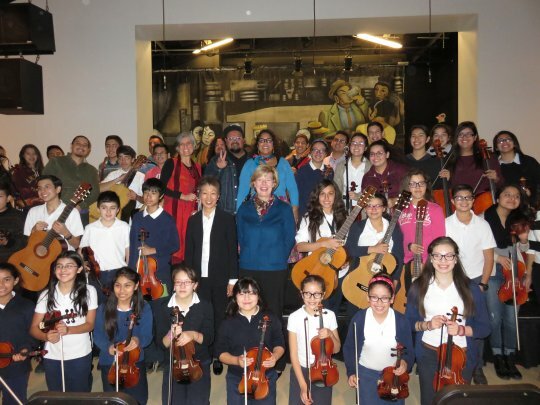 NEA Chairman Jane Chu with Wisconsin Senator Tammy Baldwin and musicians from the Latino Arts Strings Program in Milwaukee, Wisconsin. It’s an aim we share at the NEA. Every year, we fund millions of dollars in arts education projects across the country, introducing students to dance, music, theater, visual arts, and media arts of all types and styles. Our end goal, isn’t necessarily to teach children how to finger a B-flat on a saxophone or to master ballet en pointe. Instead, it’s to provide academic equity, so that every student is engaged, empowered, and equipped with the tools necessary for success. Multiple studies have shown the benefits of arts education. Children exposed to the arts participate more frequently in civic activities, such as volunteering and eventually voting. Test scores rise in non-arts subjects, truancy rates decline, and school attendance increases. But despite this research, access to arts education for students has steadily declined throughout the country. Decision-makers consider arts education an extra. This means that schools with low budgets and low-income student bodies are the least likely to have arts education, even though these are the very students who benefit from it most. Consider this: our 2012 report The Arts and Achievement in At-Risk Youth found that socially and economically disadvantaged students outperformed their peers when engaged in arts-rich experiences. This extended to higher test scores, better grades, higher graduation rates, and increased college enrollment. When engaged with the arts, kids living in the deepest levels of poverty actually outperformed the general population in a number of areas, including math grades and high school graduation rates. In January, the President’s Committee on the Arts and the Humanities issued a report on their Turnaround Arts Initiative, which integrates arts into the curricula of some of the lowest-performing schools in the nation. As a result, these Turnaround Arts schools improved, on average, 22.55 percent in math proficiency rates and 12.62 percent in reading proficiency. Half of the schools observed increased attendance rates and five out of eight schools saw dramatic reductions in disciplinary actions. NEA Chairman Jane Chu joins students in a music class at Dr. Martin Luther King Jr. elementary school in the Compton neighborhood of Los Angeles. This school is taking part in Turnaround Arts: California. If we want to get serious about closing the achievement gap, as ESEA states, then we need to get serious about the arts. This is a matter of urgency, especially given recent news that 51 percent of U.S. public school students now live in poverty. Arts education is vital to the future of our young people and our country, giving a leg up to those who need it, and giving children from every background new opportunities for growth. Every school district that cuts arts education from its budget is cutting short its students’ potential for success, both in- and out-of-school. Eventually, it will also affect their professional lives. Unemployment rates are lower for those with high school diplomas than for those without, just as those with bachelor’s degrees have lower unemployment rates than those who did not graduate college. So it becomes a matter of marketplace that students from all backgrounds are more likely to graduate high school when exposed to the arts, and that low-income youth are twice as likely as their peers to graduate college if involved with the arts as youth. But the impact runs deeper than a degree. By exposing our children to the arts, we are teaching them in ways that flash cards and textbooks cannot. The arts teach us how to think creatively and give our brains license to search for color where others might see black-and-white, or to create music when others might stay silent. These are the qualities of leaders and of visionaries. It’s not surprising that in interviews with 1,709 CEOS, IBM found that creativity was among the top four traits sought after for hiring. Furthermore, it’s been found that Nobel Laureates in the sciences are 17 times more likely than the average scientist to be actively engaged with the arts. Our imaginations are stimulated by the arts, and it’s imagination that inspires us to innovate, to search for new solutions, and to dream of new ideas that will advance our companies, our communities, and ourselves as lifelong learners. As policy conversations continue with ESEA, I hope we will all remember that in order for our schools and students to succeed, we also need to search for new solutions and dream of new ideas. Looking to the arts just might be the perfect place to start. This article was originally published on the NEA Art Works Blog (March, 18th 2015). Jane Chu will be one of the keynote speaker of the national arts-in-education conference, Building pARTnerships through Community Connections. Hosted by Young Audiences Arts for Learning, the conference will take place at the Kansas City Marriott Country Club Plaza, on April 23-25, 2015.